The Famed Oscar Mayer Wienermobile makes an unannounced stop in Garryowen. Imagine the surprised faces last week when travelers exited Garryowen's Custer Battlefield Museum and came face to face with a giant wiener. The famed Oscar Mayer Wienermobile recently made an unannounced stop in Garryowen, while on its way to several county fairs in Wyoming. Lauri Chia, the driver - or "hotdogger," as the drivers are known - took a small detour from her appointed rounds touring the country to visit with locals and tourists at the tiny historic town. "Garryowen is an amazing stop on the road...there is so much history to see in Montana," she said. The Wienermobile, one of seven currently touring the country promoting Oscar Mayer products, was a great hit in Garryowen. 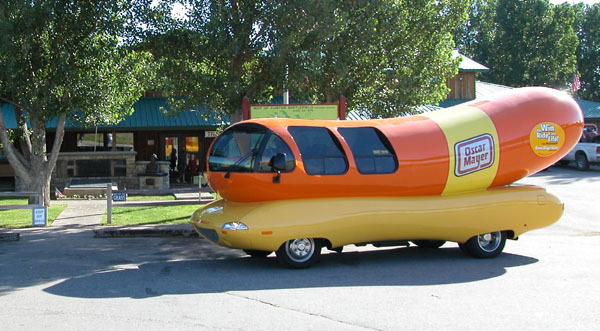 Christopher Kortlander director of the Custer Battlefield Museum, was as surprised as his visitors when the enormous hot dog on wheels pulled into his parking lot. I couldn't believe my eyes," he laughed. "I never thought I'd see this terrific marketing idea in my own driveway." The Oscar Mayer Company's first Wiener mobile, a 13-footer, was built in 1936. Since that time many improvements have been made on the concept vehicle. Today's Wienermobile is almost 30 feet long and filled with the most up-to-date equipment and extras, including; a gull wing door with an automatic retractable step; a voice activated GPS navigational system; a mustard splattered walkway; an audio center complete with wireless microphone; blue sky ceiling art; six mustard and ketchup colored seats; and an official Wiener Jingle horn.